One of the most common and most bothersome problems in a vehicle is vibration. The fix could be something relatively cheap and simple, like a tire rotation or balance. Or it could signal more serious auto problems -- something more costly, like steering or suspension issues. If your vehicle shakes, shimmies or vibrates out of the ordinary keep reading. Sometimes a shake or shudder will emanate from the engine compartment, because the engine isn't getting enough air, fuel or spark that it needs to run smoothly. Symptoms that might indicate such an engine-related case of the shakes include shudder or jerking occuring during acceleration. Engine mounts can cause vibration in Drive or Reverse, they usually go away when you put the car in Park. If an axle gets bent -- which is actually quite easy to do in a collision or other mishap -- it will create a jostle of a ride afterward. With this problem, the vibrating often picks up in intensity the faster you drive. Do those bad vibrations appear or intensify when you apply the brakes? If so, there's a strong possibility that your car is tooling about with a warped brake rotor, or rotors. The rotor is the shiny, silver disc-shaped component on vehicles with a disc brake system. The rotor can get bent out of shape due to heavy wear and tear -- basically, overheating from more stopping than that particular rotor can handle. Instead of being uniformly flat all the way across, a deformed rotor is raised or lowered on part of its surface. The calipers and brake pads, which squeeze the brake rotors to make the car stop, can't get an even grip on a warped rotor. Hence, vibration. Bad wheel bearings will cause vibration too. However the car will ride very noisey and if you steer the car left or right the pitch of the noise will change. 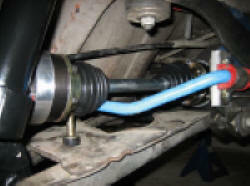 Often, you'll feel your car vibrating directly through your steering wheel - indicating problem to be in the front, or in the bottom or your seat - indicating the problem to be in the rear, at slow speeds (10-30mph). One or more wheels may suffer from excessive "play," or wobbliness, at the hub itself. First, let's assumee that each wheel is fastened securely to its hub with properly torqued lug nuts. Rotate the front tires to the back and see if the problem moves with the wheels. If the vibration is still in the steering wheel, than the wheel bearings and the suspension need to be inspected. Tires are the usual culprit in most cases. Tire issues can contribute to your vehicle's shake or vibration. Car vibrates at 45mph and over speeds -- requires tire balance. Alignment will not solve your problem. Tires can also have separated threads, specially if they are old, causing a thumping noise on every revolution or Tires are out of round and don't roll evenly, in this case they should be replaced immediately. Keep in mind there maybe plenty of other reasons for your vibration. These are just a few common causes.